I’m pleased to be here with you today for your annual conference and I want to thank the college for the work that you have done on behalf of your members over the past 17 years. From developing standards of practice to providing professional learning opportunities, the College has worked to support its members and I have every confidence it will continue to do so in the coming years. I know from experience how valuable the work of the College is to our government. Also being part of the International Forum of Teacher Regulatory Authorities (IFTRA) allows you to share best practices and be part of a global community of self-regulators. The important work you do with the IFTRA helps move us forward and inspires public confidence. Your commitment to the teaching profession and to Ontario students is commendable. Our government values the partnership we have with the college because together, we are building a strong publicly funded education system for our province – and helping to prepare our young people for success. Since 2003, we have achieved great results together to strengthen confidence in our publicly funded education system. Student assessment scores in reading, writing and mathematics have all increased and high school graduation rates continue to rise. Back in 2004, the graduation rate in Ontario was just 68 per cent. That’s about one-third of all students who were not graduating from high school! Through a lot of hard work by parents, teachers, school administrators, students, and organizations like yours, our graduation rate is now 83 per cent. That means that more than 138,000 additional students are on a better path in life. Similarly, a decade ago, about half of all students in Grades 3 and 6 were achieving the provincial standard in literacy and numeracy, which is a ‘B’ grade. Today, 72 per cent of Ontario’s students are meeting or exceeding that standard. We are proud of our accomplishments over the past decade. However, there is more to do to prepare our children and students for the new knowledge-based global economy. In addition to having good reading, writing and math skills, we also want our students to become personally successful, economically productive, and actively engaged citizens. 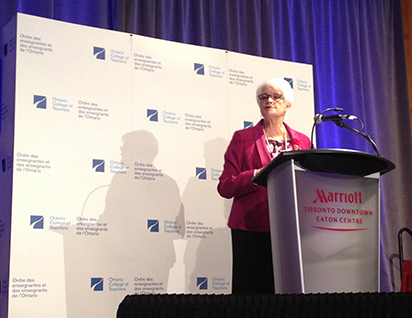 A year ago, we began the work on developing the renewed vision for education in Ontario. We consulted extensively with more than 300 stakeholders and 900 individuals from our usual education partners. But we also sought input from the business and non-profit sectors. I’d like to thank the College for its contributions through the Partnership Table and for encouraging members to participate in our online consultation. I’m pleased to say that there was a remarkable consensus from you and others, on how we can make further progress. A major element of that consensus is reflected in our shared commitment to cultivating and continuously developing a high-quality teaching profession to support the success and well-being of all Ontario students. This past April we launched our renewed vision for education. This vision builds on the solid foundation in education that we’ve been working on together for the last decade. While we know our goals are ambitious, we have proven in the past, that working with partners like you, that we can achieve them. As we look forward, we will focus on enhancing public confidence, which is a goal that’s closely tied to your theme today. I believe inspiring public confidence is something we do as a collective. In fact, the entire education sector works towards that goal every day. Together we continually share best practices within the system to support enhanced confidence for all of our partners – our teachers, staff, principals, students and parents. So, whether we consider the role of increased accountability and transparency, as was recommended by Justice LeSage for the teaching profession, or the opportunities offered by enhancing teacher education programs, the role that public confidence plays is important to the education sector as a whole. What is even clearer is how these goals are reached when we work together. In the case of Justice LeSage’s 49 recommendations, the need for improved disciplinary and investigative processes at the College was apparent. So, we are working with the College to strengthen the discipline practices at the College in order to make the process clear and transparent for parents and students. And we remain committed to implementing the report’s recommendations to modernize regulatory practices and to increase accountability and transparency around teacher discipline. While the exact timing of reintroduction of our legislation is not yet known, I know that the College is already making many improvements in their processes related to these recommendations. We also know that confidence is enhanced through our reforms to teacher education. These include doubling the practicum requirement and introducing mandatory core content that will provide a greater degree of transparency and consistency in what is being taught in Ontario’s publicly assisted initial teacher education programs. For example, all faculties will be teaching their students mathematics and literacy pedagogy as foundational for either elementary or secondary student learning. It is in your work in these areas that help us on the path forward by inspiring public confidence and maintaining the high standards of practice and conduct expected of our educators. I want to thank you again for your ongoing contributions to education in Ontario, as well as your support of our renewed vision. I encourage you to continue your work as champions of teacher professionalism and to share your successes and the high standards of your members with the public. Thank you for inviting me to speak to you today and thank you for all your dedication, hard work and commitment to ensuring our students succeed in school and beyond. I look forward to continuing our work together to deliver a world-class publicly funded education system. I hope you enjoy the conference.